Refers to when, shortly after a person swallows, some swallowed material returns from below the esophageal entrance back up into the hypopharynx. This finding is an almost certain diagnostic indicator of cricopharyngeal dysfunction, usually with an associated Zenker’s diverticulum. 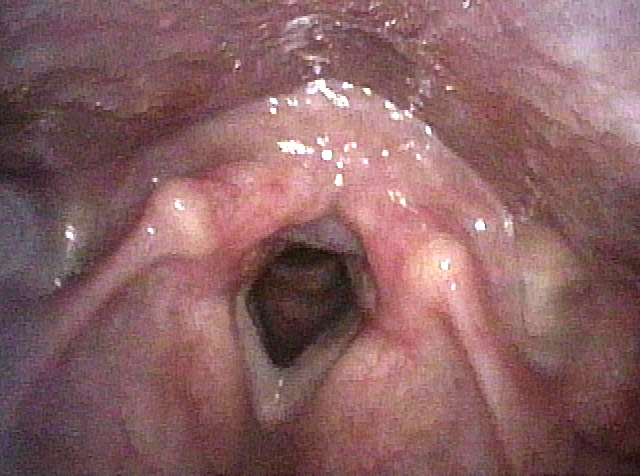 If this reflux occurs during a videoendoscopic swallowing study, the clinician will see that, though there may be little to no hypopharyngeal residue immediately after the swallow, a moment later some swallowed material (e.g., blue-stained applesauce or water) reappears and wells up in the post-arytenoid area and into the pyriform sinuses. 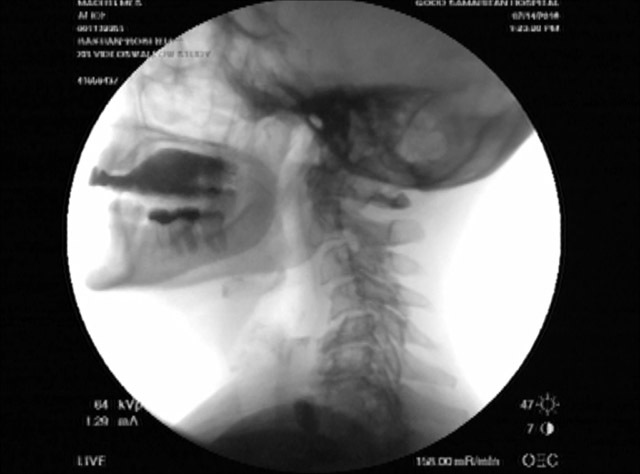 If this reflux occurs during a videofluoroscopic swallowing study, the clinician will see barium remaining in the Zenker’s sac and, immediately after each swallow, moving back upward into the hypopharynx. This middle-aged man has solid > liquid dysphagia, and x-rays elsewhere (not available at this visit) reportedly showed a Zenker’s diverticulum. Even without that prior knowledge, the highly organized hypopharyngeal salivary pooling is strongly suggestive of this diagnosis, but subsequent photos of VESS even more so. During VESS, after completing a swallow of blue-stained applesauce, note the residue in the post-arytenoid area. A third of a second later, additional material has emerged from below, likely ejected upwards from the Zenker’s sac. ...again, about 2 seconds later, the left pyriform sinus fills from below as the material in the sac is ejected upwards. 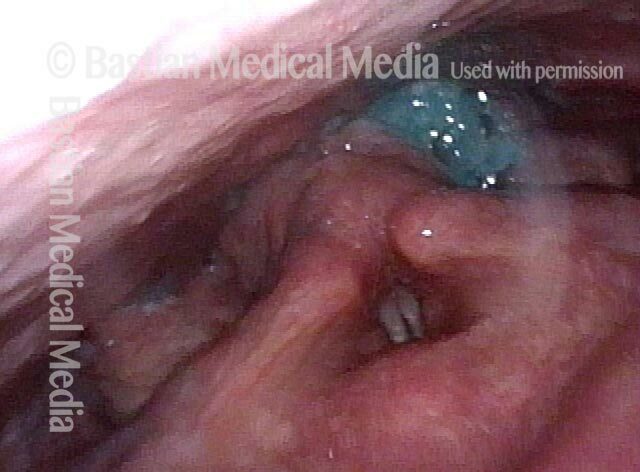 In a patient with a known Zenker's Diverticulum, who has just finished swallowing blue-stained applesauce during VESS. Less than a second later, the applesauce and some saliva bubbles reflux upwards from the Zenker's sac into the postarytenoid area. Here, the patient has just swallowed a cheese cracker. About a second and a half later, this material, mixed with saliva, returns from the sac. A second later, barium is "squishing" upwards from the sac. Additional barium has come upwards into the postarytenoid area (compare with Photos 2 and 4).